I’ve never had the opportunity to eat at Hot and Hot Fish Club, mainly because it’s the kind of place I would go for a celebration, anniversary, or major accomplishment. 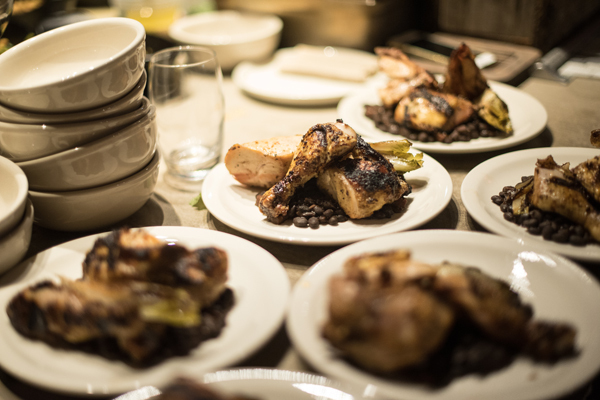 Hot and Hot requires reservations and Ovenbird doesn’t. They’re both fancy to look at, but Ovenbird is the more casual of the two. As Hastings told us, Ovenbird is geared more toward our generation. 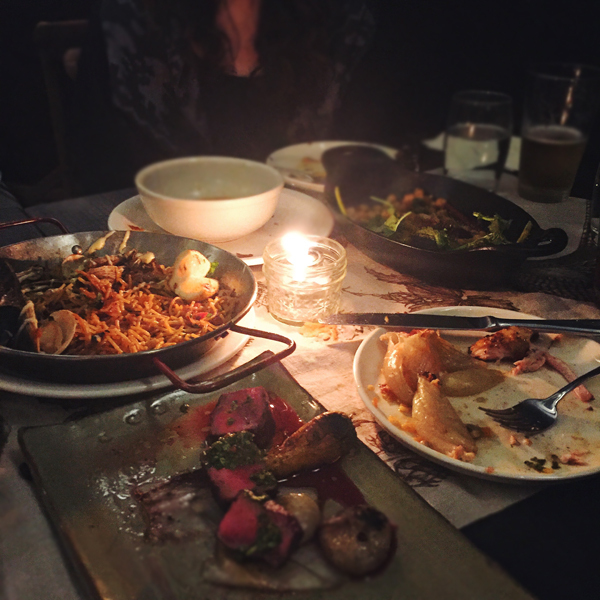 The small plates are meant to be shared and are a more reasonable price. All the food, which is fresh, local, and inspired by the Southern outdoors, is cooked over a live fire. I noticed that there seemed to be several different “areas” where you can be seated. The first room you walk into has the hustle and bustle of the kitchen and large doors open to the outside. Our event was in a more private area off to the side, and there’s an outdoor patio area on that side as well. Then there’s this area out front that only had a few tables, spaced apart from each other, and only lit with tiny candles. Since it’s now dark at 5:30, I remember looking at this area thinking it looked so romantic. 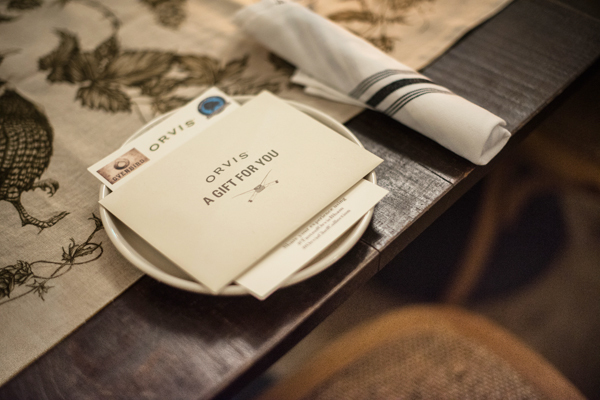 All of this to say, there’s something for everyone at Ovenbird, for any occasion or any day of the week. 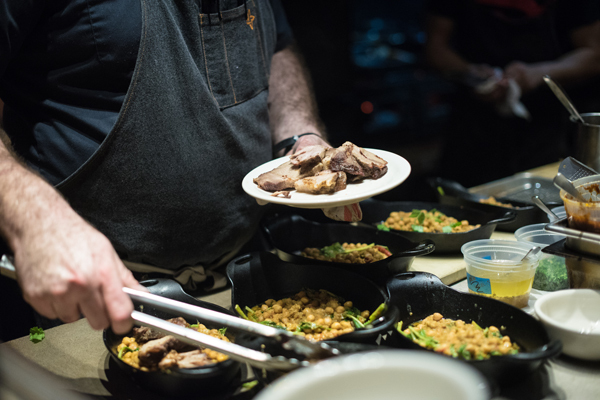 The event was to celebrate and launch the new Chef’s Collection from Orvis, which was curated by Chef Chris Hasting, his wife Idie Hastings, and Black Warrior Riverkeeper’s Charles Scribner. The new collection, which will be on display and available for purchase in the Orvis Birmingham store at The Summit from 11/4 to 11/18, features items including fishing and shooting accessories, outdoor apparel and everyday lifestyle items. During this time, 20% of all in-store sales of items featured in the Orvis Chef Collection will directly benefit Black Warrior Riverkeeper cleanup efforts on the Black Warrior River. I’ve told you a little bit about the restaurant, a little bit about the event, and now I’d like to *attempt* to tell you how incredible the food was. First of all, I am still not over this cocktail. 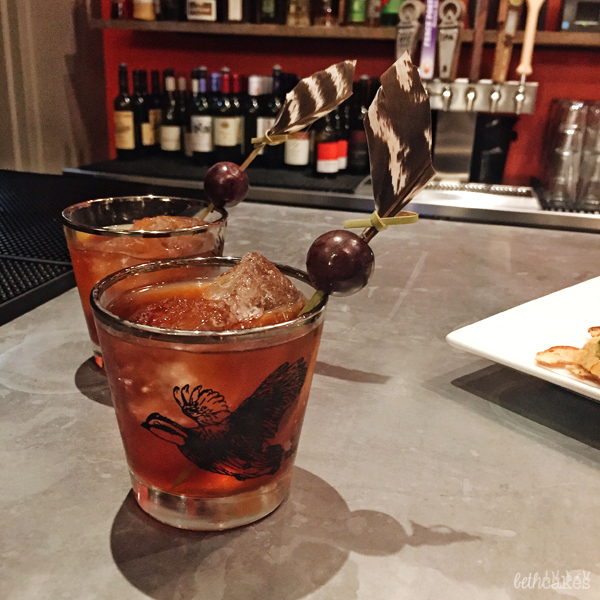 It was similar to an old fashioned and was garnished with a muscadine and a feather from a turkey that Hastings and his son shot back in the spring. Not only does Hastings hunt and catch a lot of his food, he also preserves the feathers and creates pens for gifts and thank you notes. We had several dishes placed in front of us throughout the evening, and while I cannot remember each ingredient, there was paella, beef shoulder, pork shoulder, roasted beets and carrots, fennel salad, onion and apple salad, spit roasted chicken…and, friends, this beef fat candle. 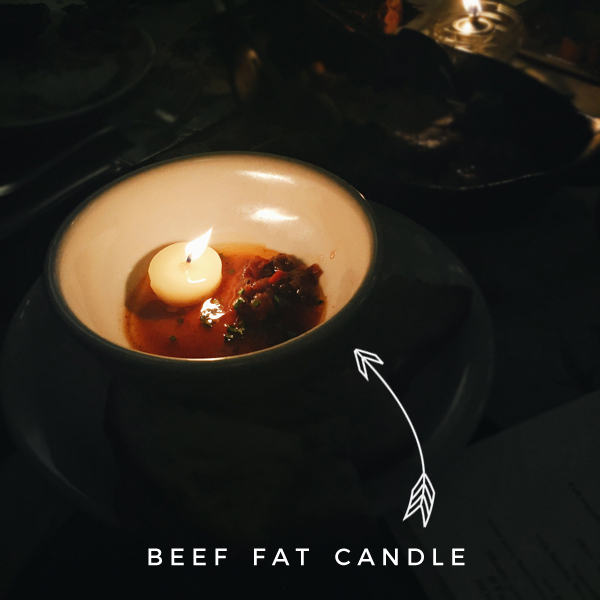 I had heard that this beef fat candle was a thing at Ovenbird, and I was really excited when they started placing them on the tables. It works like this: you blow out the candle, remove the wick, stir everything together with the broth in the bowl, and then dip the bread in it. Hastings came around to each table to talk about the food and the inspiration behind it. He told us that this candle came about because of a memory from his childhood. He told us how his father would be at the head of the table, then him and his siblings, and then his mother at the other end of the table. He sat next to his father, and so whenever his father carved the meat for dinner, he would reach out and dip his bread in the juices and salt and flavors of the meat. I bet you can guess which course I was excited for the most. 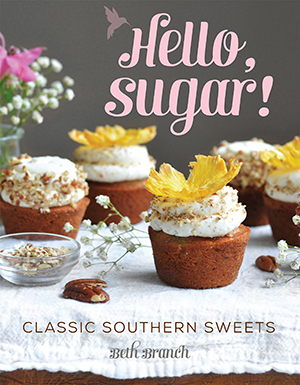 🙂 Meredith told me about her birthday dinner at Ovenbird a few weeks ago and so I’d heard about some of these desserts. You guys. It was all wonderful. 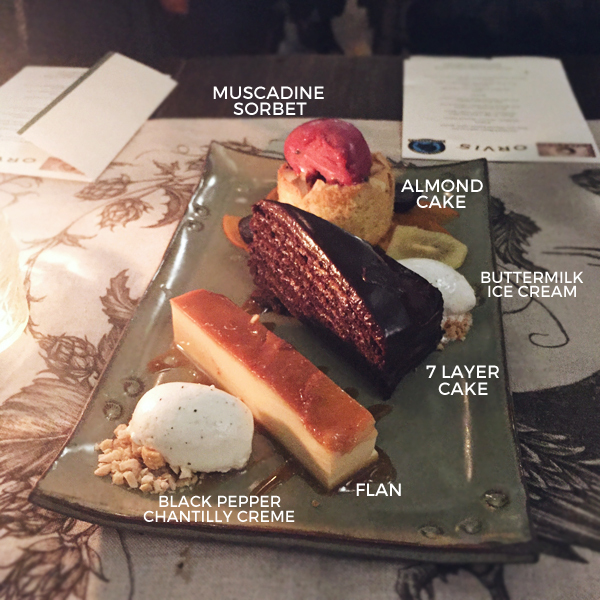 The 7 layer cake was my favorite because y’all know I’m a chocolate person, but I was really surprised by how much I liked the almond cake with muscadine sorbet. I’ve never really been a huge fan of flan? Maybe I just don’t get it? But I wasn’t about to pass it up and was surprised by how good it was as well. Overall, I completely enjoyed myself at the event. Meredith and I represented Birmingham Bloggers and thankfully ran into some blogger friends. I had so much fun sitting there just chatting about blogging and life as “young adults.” I realized afterward that I’ve kind of been in a funk the last couple of weeks, kind of a busy but boring spell in my daily life, and this evening was exactly what I needed to snap myself out of it. We laughed and enjoyed the wonderful food, the cocktails, the company, and the lively atmosphere. I left thinking, Wow, I can’t believe I was invited to this, and, I’m so glad I got to experience that. 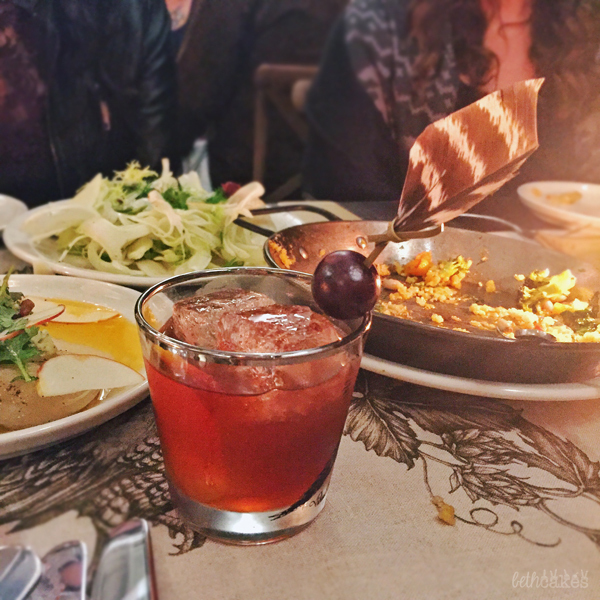 And I think that is exactly how an evening at Ovenbird should be spent.